After a bit more than one year of development the new update release GRASS GIS 7.4.0 is available. It provides more than 480 stability fixes and improvements compared to the previous stable version 7.2. 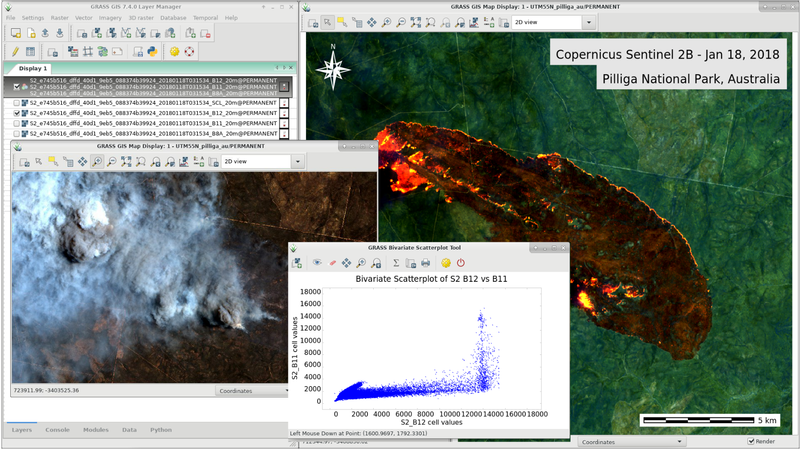 An overview of the new features in the 7.4 release series is available at New Features in GRASS GIS 7.4. Efforts have concentrated on making the user experience even better, providing many small, but useful additional functionalities to modules and further improving the graphical user interface. Users can now directly download pre-packaged demo data locations in the GUI startup window. Several modules were migrated from addons to the core GRASS GIS package and the suite of tools for ortho-rectification was re-implemented in the new GRASS 7 GUI style. In order to support the treatment of massive datasets, new compression algorithms were introduced and NULL (no-data) raster files are now also compressed by default. For a detailed overview, see the list of new features. As a stable release series, 7.4.x enjoys long-term support. … further binary packages for other Linux distributions and Mac OSX will follow shortly, please check at software downloads. To get the GRASS GIS 7.4.0 source code directly from SVN, see here. This entry was posted in Blog, GRASS, OSGeo on February 1, 2018 by neteler.